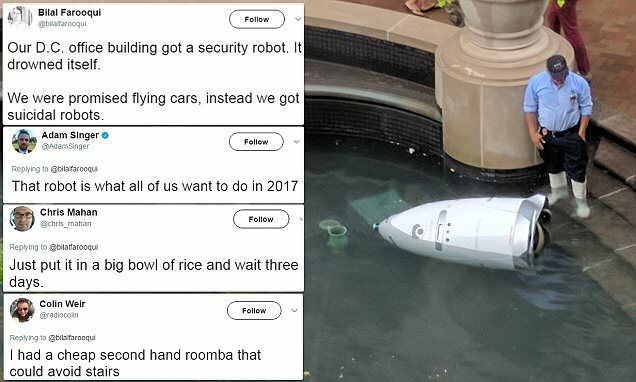 STEVE, the security robot that plunged into a Washington, D.C. fountain while on patrol, didn't commit suicide, after all. It turns out the roboguard was not a victim of suicide or foul play and instead took a tumble after skidding on a 'loose brick surface,' its manufacturer said on Friday. Its Silicon Valley-based maker, Knightscope, said data from STEVE's 'black box,' as well as video and tests, showed the unscheduled water stop was caused not by foul play or rain, but by an algorithm failing to detect the uneven surface, resulting in a skid. Work is under way to address the problem. '...Developing state-of-the-art autonomous technology must be done in real-world environments,' Knightscope said in a statement. According to the company, STEVE has 'an extensive catalog of security capabilities' and was mapping the grounds in order to be fully autonomous when the incident occurred. It said a replacement machine was on site within 48 hours. The client, the Washington Harbour, a commercial and residential development, received a month's credit and its all-inclusive service policy covered maintenance, repair, shipping, and redeployment costs. The July 17 incident in the city's Georgetown neighborhood prompted quips from many on social media, with some joking that the robot cop, a K5 Autonomous Data Machine, had tried to commit suicide or quit its job, and that it was a 'win' for humans.